Car hoists are a range of hoists that make easy work of loading and unloading wheelchairs, mobility scooters and power-chairs from your vehicle. A boot hoist is the perfect addition to a car or van for someone with reduced mobility, whether that is due to a disability, health problem, age or other issues, who wants to keep their independence when venturing out of the house. Without needing to change your car, these hoists are easy to accommodate and allow you to take your mobility device with you wherever you go. These hoists fit perfectly in most cars, as long as the boot of your vehicle opens far enough for your scooter or wheelchair to fit through. The Smart Lifter is a hoist that enables a mobility device, such as a wheelchair, scooter or powerchair, to be easily and simply lifted into a car boot at the touch of a button. This eliminates the need for the wheelchair/scooter user or family member to struggle with getting the device into a vehicle when wanting to venture further afield. 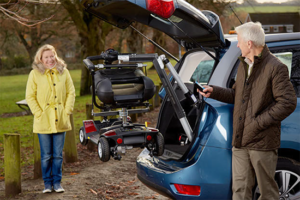 Within the Smart Lifter range, there are three different hoists that best suit a range of mobility vehicles, from wheelchairs to scooters and depending on the size and weight of your mobility vehicle.